Introduction: Customer was using on-premises storage infrastructure that was a single point failure. The DR solution was expensive with a lot of administrative efforts. Challenges: The client had lots of technical and administrative challenges in managing storage DR. It was expensive, hard to deploy and manage. 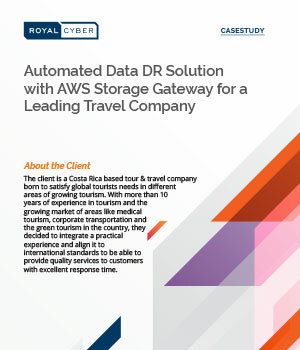 Solution: Consultants from Royal Cyber carefully reviewed the client business challenges and provisioned an iSCSI based storage volume on AWS connected with on-premises asynchronously.